What does your night stand look like? Do you crawl into a cozy bed at night, look over at your nightstand and feel calm and relaxed? Sometimes a simple makeover can help promote natural sleep while taking your room decor up a notch. 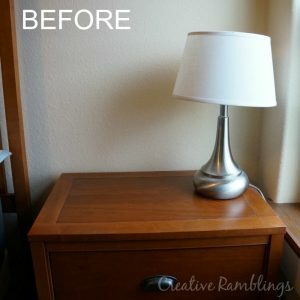 My husband’s nightstand was really bare, it wasn’t more than a basic lamp. He likes to lay in bed at night to read and relax and this corner was not helping. The light was harsh and there was nothing calming about the bare space. 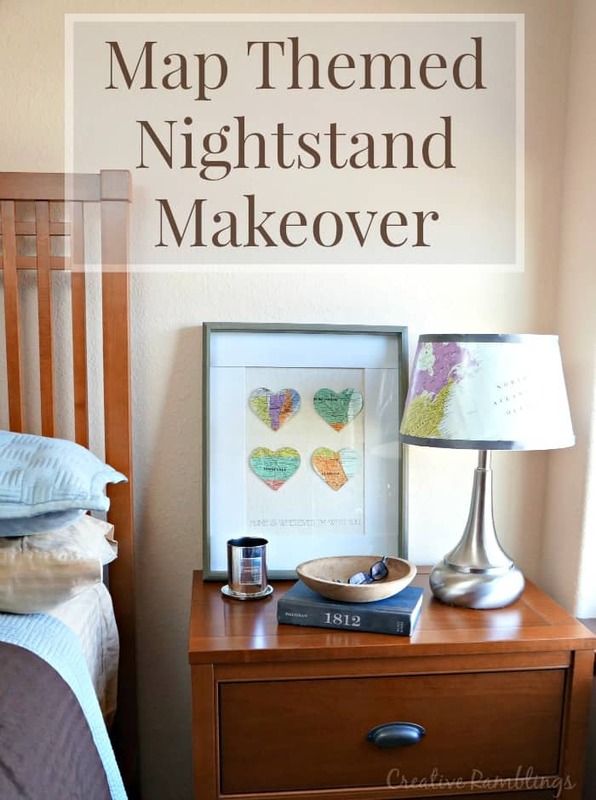 Take a look at this simple nightstand makeover I did to help him read, relax, and promote natural sleep. Here is what the nightstand and lamp looked like before. Not much to see. I chose to create a map themed space for my husband, he loves to read about history and at one point he had an entire office decorated with maps. I pulled out some of his old maps and got to work. The nightstand has a couple of components. To keep costs down I picked up a shadowbox using a coupon and opted to make my own matte. I cut white craft foam and used card stock as the backing. I printed a line from one of our favorite songs on a piece of card stock “Home is wherever I’m with you”. 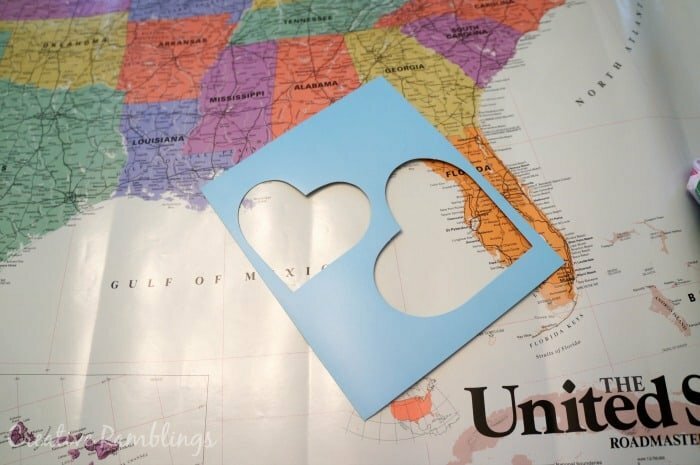 I used a heart stencil to trace and cut out states that have special meaning to us. We got engaged in Vermont, we met and live in Wisconsin, one of our favorite pre-kid vacations was to Tennessee, and we just had an amazing vacation as a family in Florida. I added the hearts with foam squares to the card stock to complete this piece. We went from having a bare and harsh nightstand to a warm and relaxing space. 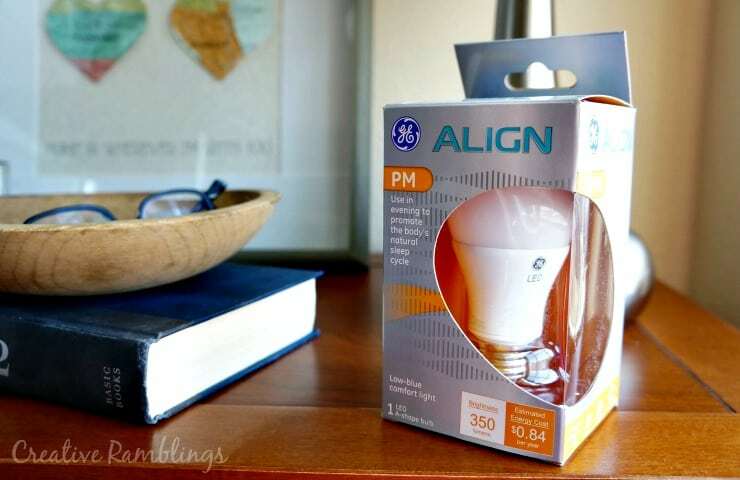 I tried out a GE Align™ PM LED Light Bulb in this lamp. It gives off a soft orange/yellow glow that helps promote the body’s natural sleep cycle. The bulb contains very low amounts of blue light which helps you rest easier. My husband has been using this light in the evening, 30 minutes before bedtime, while he reads. Using this light can help your body maintain its natural sleep-wake cycle and help maintain better sleep rhythms. This NEW product is only available on Amazon.com. Thankfully I am an avid Amazon shopper. You can grab one today and have it in your bed side lamp in a matter of days. 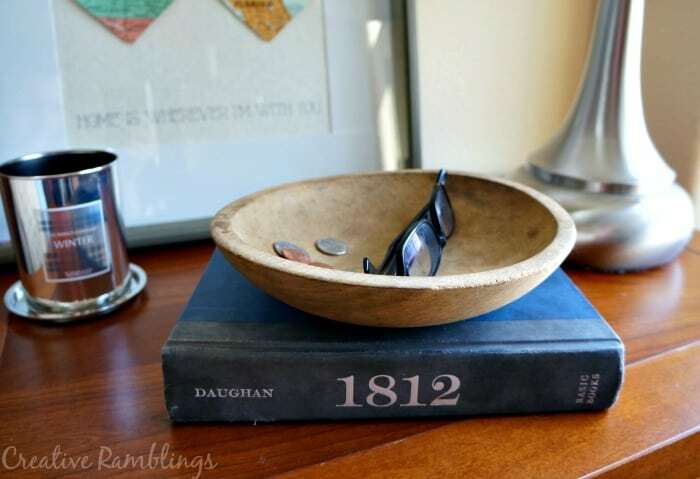 I added a simple wood bowl to hold his glasses, change, phone and anything else he may have when he heads to bed. I also added a silver candle in a subtle scent we both love. I kind of love how all of this looks with his current book. My husband loves his new nightstand and has been impressed with the bulb. He is able to relax and read in a calming space before bed. Not only does the soft light help promote sleep but being surrounding by things he loves helps him relax as well. How about a chance to win more than $800 in Prizes from GE Align #SleepAligned Sweeps! Use the form below to enter. Tell me about your nightstand, does it promote natural sleep? What does it need to help you relax at night? What a cute idea! I love how simple projects can make a huge change in an area of your home. Our nightstand is in need of a makeover! Right now it doubles as the diaper changing stand (not that we’re changing the baby on there just the essentials are there)… I’d love to use it more for it’s intended purpose. I hear you, sometimes it’s so hard to have a nice grown up display with little ones around. Soon enough! Thanks for commenting today Kori. I love this! I think this would be great for my son’s room one day. I especially love the shadow box! Pinned it to my craft board! Thanks Amy, so glad you like it. I do not consider myself to be a very crafty person but this looks too easy not to try! I will definitely be tring to spruce up my bedroom now! Thank you for this wonderful share! Yay! Yes it was not that difficult, I was pleasantly surprised. So glad you like it, thanks for reading. I honestly never even thought of doing this but such a good idea! My fiance and I were just talking about these bulbs yesterday. I saw another post on them and think it is definitely worth trying out, especially the AM one for my daughter who absolutely is not a morning person ; ) Love the shadow box tutorial too, thanks for all the great info! I would love to try the AM one too, I fall asleep a bit easier than my husband but have such a hard time waking up in the morning. Thanks for your sweet comment. I love the Map theme! I especially love the WI part…that’s where I’m from too. Awesome Shann, another Wisconsinite! Thanks for stopping by and reading. Love this night stand makeover. Such a creative touch with the maps, a great idea! I’m definitely going to check into these bulbs. Thank you. Thank you so much Jane! I hope you check out the bulb, we have loved it so far. Something like this might be just the trick for your daughter. This bulb has a very calming effect and special pieces to surround you before bed and so nice. I hope you find a solution. Thanks for stopping by and pinning! These are such cool ideas and could be used to suit any theme in a room. I love the finished product! Thanks Wendy, yeah you could use just about any medium to cover the shade and create a piece of art for a room. Thanks for your sweet comment. Oh my goodness… I absolutely LOVE the lamp redo. I’m a total nerd for map decor. This is lovely! 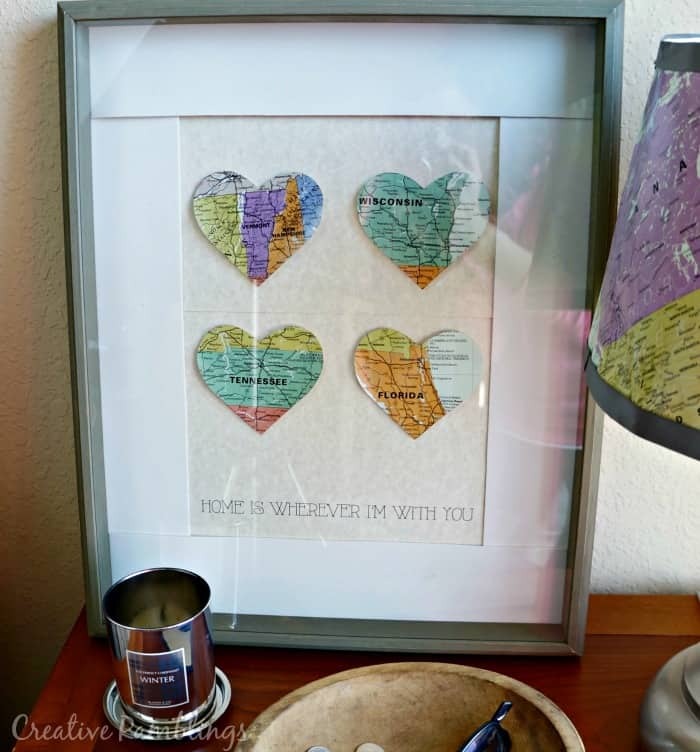 I’m so glad you like it Donella, something about maps just adds character to a room. Thanks! You are so creative! I absolutely love the shadow box! Thank you Christy, you are too sweet! this is awesome! very unique, i would try this as a father’s day gift! That would be such a fun gift. Thanks Danica. 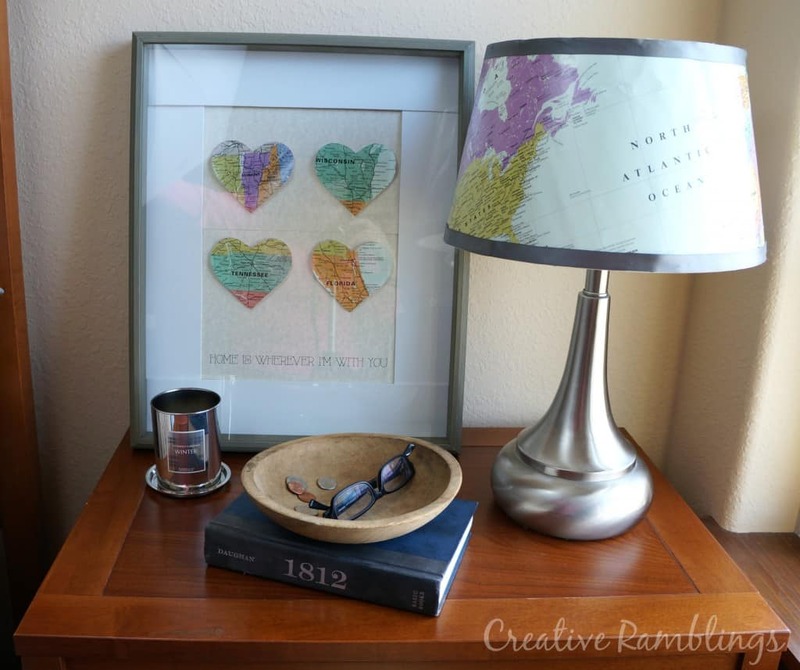 Sarah, I can’t believe the difference your map artwork and adding the map to the lamp made to your husband’s night stand and space. You did a great job , it looks gorgeous. I need to look into that GE light for my bedroom . Thank you for sharing. Pinned! I love the map shadowbox art. 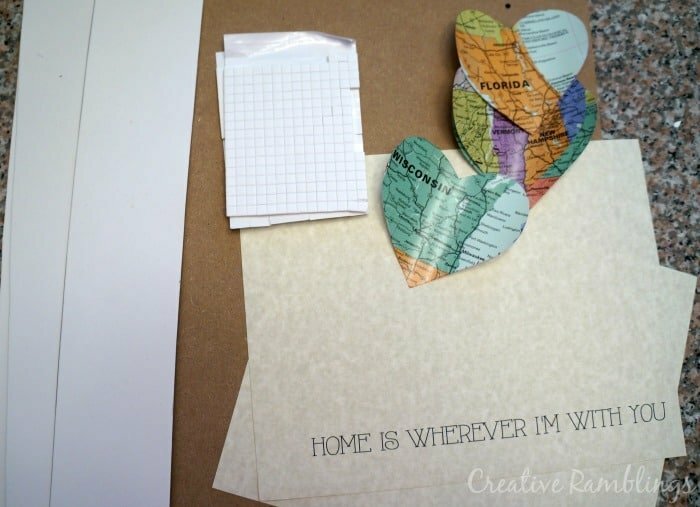 What a neat way to use old maps, or even from places that you have been to remind you of vacation memories, etc. Beautifully done! Thanks Gina, yes there are so many options for special map art. This is so great Sarah! I love the state hearts! I would love to make that world lamp to for my boys room. All that’s on my nightstand now is a baby monitor and my cell phone…time I spruce it up a bit I think!